"There are two kinds of light—the glow that illumines, and the glare that obscures." Thurber’s words might be metaphorical, but your landscape at night can be subtly and magically illuminated, or it can be glaring and harsh. 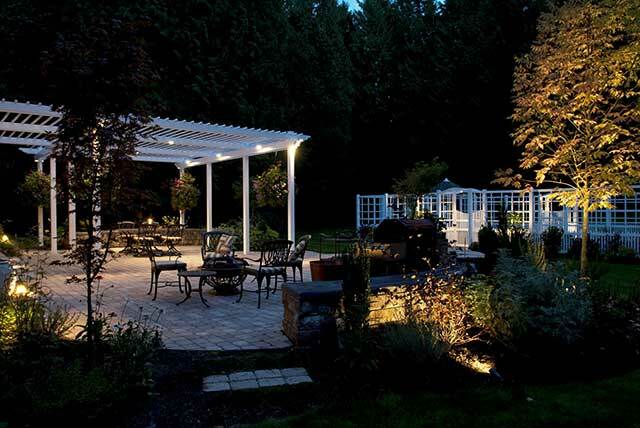 This article shares some ways to create nighttime beauty in your Seattle-area landscape and offers general information on the various types of landscape lighting fixtures and their relative costs. You might be familiar with the saying, "Right plant, right place," which refers to selecting and siting plants appropriately relative to sun, wind, soil conditions, etc. "Right light, right place" is just as apt. Too many lights, poorly sited lights, and inappropriate fixtures are often worse than no landscape lighting at all. Different fixtures have different functions, and part of the art of landscape lighting is determining what should be illuminated, which fixtures and finishes to choose, how many fixtures to place, and where best to place them. Pathlights are less about drama and more about safety. 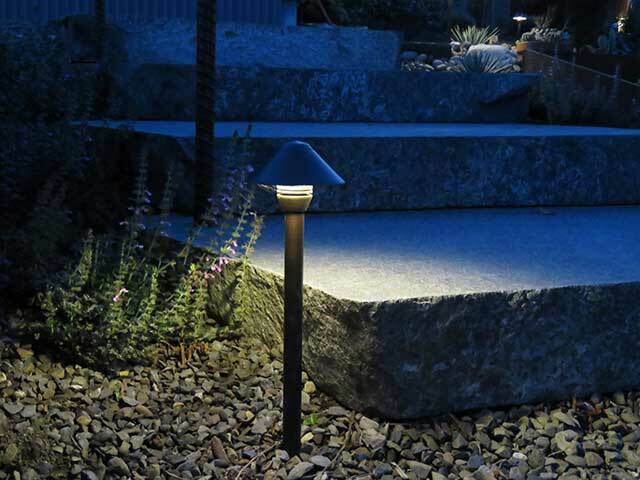 Well-placed pathlights should enable you and your family and visitors to move about your landscape safely after dark. Pathlights need to be placed strategically to promote safety while not drawing attention to themselves. Strategically placed pathlight illuminates granite riser after dark. Photo courtesy of Janine Anderson. Uplights are often placed in groups of two or three to showcase important features in a landscape such as specimen plants, boulders, and artwork. The bark and canopy of a deciduous tree can be shone to dramatic effect. For denser plants, such as conifers, and sculptures, uplights can be placed so that a striking silhouette of the object is cast onto an adjacent wall. Well lights function like uplights, except they are placed below the surface of the ground, for example, in lawns, rather than above ground. 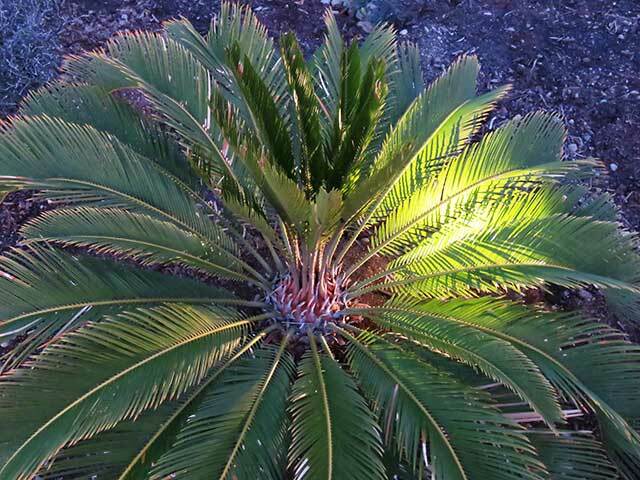 Uplight shows detail of cycad fronds. 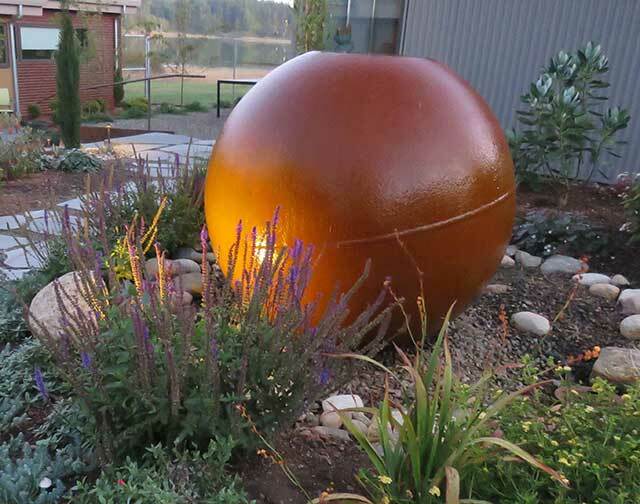 Uplight illuminates fountain fashioned from recycled propane tank. Downlights positioned above the garden cast diffuse light through the leaves, almost like moonlight, creating graceful shadow patterns. These fixtures should be installed high in a tree and angled no more than 30 degrees from vertical. To balance the effect of the light from above and to make the location of the fixture less obvious, uplights can be placed at the base of the plant to fill in the canopy understory. Downlights are also effective when hung in an arbor, casting soft light into a seating area. Downlights in arbor illuminate patio area, while uplights showcase tree to right. Photo courtesy of Nyce Gardens. Wall or deck lights are versatile, unobtrusive fixtures that can be mounted under the capstone of a wall or the overhang of a bench or stair tread. Not only do these applications enhance safety and define edges, they also create a pleasing atmosphere by subtly illuminating a seating area. 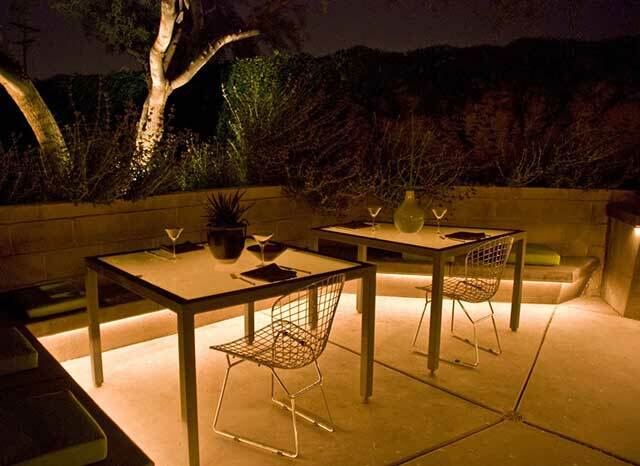 Wall lights placed under bench overhang add atmosphere while subtly illuminating patio floor. Photo courtesy of Realm Environments. Specialty fixtures include submersible lights that illuminate a pond or other water feature. All of the various types of fixtures are available in a variety of styles, from modern to traditional, to compliment the architecture of your home. There is a wide array of finishes as well. Among the more popular are metallic bronze, nickel plate, copper, and stainless steel. The technology of landscape lighting has evolved in recent years. The biggest advance has been in the development of low-voltage LED fixtures versus conventional halogen or incandescent fixtures. The layout and design of an LED system is much simpler because the lower power requirements of LED fixtures all but eliminate the complex calculations needed for the older halogen systems. The initial investment for low-voltage LED fixtures is approximately 40% greater than for halogen fixtures, but the cumulative cost after 10 years is less for LED fixtures because of energy savings and a much longer lamp life. There are virtually no bulbs to burn out and replace, greatly reducing maintenance requirements and resulting in a system that runs much more smoothly. This article highlights just a few of the many ways landscape lighting can be used to brighten your landscape. With the advent of low-voltage systems, homeowners might consider the DIY approach; however, given the wide array of fixtures and the importance of selecting the right light for the right place to create an effective and pleasing overall design, it is advisable to enlist the services of a landscape designer. Landscape designers can help you select the best fixtures for your project and recommend professional installers who can create the glow that subtly and magically illuminates.